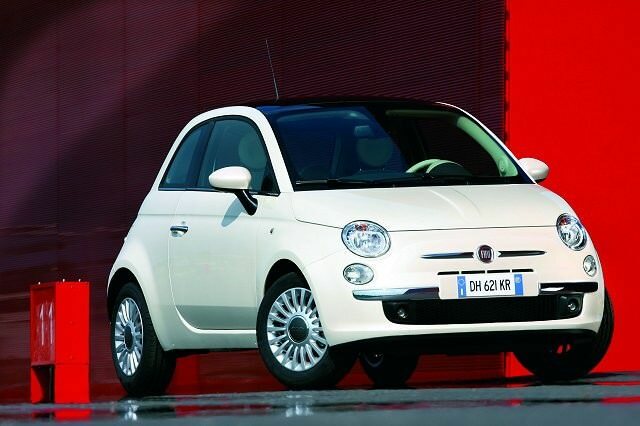 Mid-2007 saw Fiat launch perhaps its most important model since the original car to wear the 500 badge. Be damned practicality, as you’d have to be peculiarly hard of heart not to be won over by the Fiat 500. Its origins might be humble, but it’s simply brimming with character. The range is relatively extensive for a small car offering, Fiat understanding that its retro appeal might attract a wider range of buyers than city cars typically would. Trim levels are simple as well, and have remained relatively constant since Fiat introduced the 500, the line-up starting with Pop followed by Lounge and Sport. Engine choices at launch included 1.2- and 1.4-litre petrol choices, with a MultiJet 1.3 turbodiesel also offered. The smallest 1.2 and that diesel engine produce 69hp, while the 1.4-litre petrol unit delivers 100hp. Economy in all is good, the diesel’s greater frugality only really appreciable if you escape the city limits - it's also offset by its higher initial purchase price. Hardly surprising then that the majority of 500s are sold with petrol engines, meaning it’s here used buyers will have the greatest choice. Pop specification comes with the basics such as electric windows and mirrors and an adequate stereo, though you need to look out for Lounge or Sport models if you want Bluetooth connectivity, alloy wheels and air conditioning. Engine choice has stayed relatively constant through the 500’s model cycle, though 2011 saw the introduction of the TwinAir petrol unit, a sub-100g/km 875cc petrol engine that promises excellent economy - though needs driving very sedately to return that. Emissions and economy have improved across the range since it was introduced, all 500s pleasingly frugal and inexpensive to run. Fiat does offer an Abarth range of 500s, but there’s no official Abarth dealer in Ireland so they're very rare. A 1.2 Pop is the best buy, if you can live without air conditioning; or the same engine in either Lounge or Sport specification if you want to be cool inside. With so many to choose from you can afford to be picky; buy on condition and mileage - which is likely to be low given the 500’s usual environment. If you’re after a fun, good-looking and economical run-around you could do a lot worse than the Fiat 500. Easy to park, a cinch to drive and inexpensive to own and drive the 500 is certainly worth a look; plentiful choice means you can afford to be picky, too.